A durable spill kit that will fit behind the seat of a truck or hang on the wall. Sometimes you need a larger spill kit that is still small enough to stuff into a storage bin, or hang on the wall. This deluxe Spill Pak is packaged in a durable refillable water resistant yellow industrial vinyl bag with top zipper and black nylon handle. 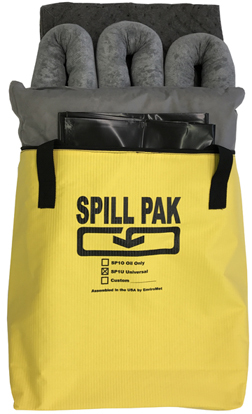 The deluxe Spill Pak is highly visible, convenient and equipped to handle many small nuisance spills. Choose an Oil Only Deluxe Spill Pak to absorb hydrocarbons such as oil, gas, diesel, hydraulic fluid and jet fuel. Choose a Universal Deluxe Spill Pak to absorb most liquids such as oils, coolants, solvents and water.